Fluid Power 2 Edition Fluid Power: Hydraulics and Pneumaticsis a teaching package aimed at students pursuing a technician-level career path. 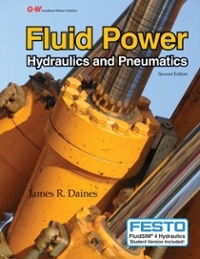 It teaches the fundamentals of fluid power and provides details on the design and operation of hydraulic and pneumatic components, circuits, and systems. Extensive coverage is provided for both hydraulic and pneumatic systems. This book does not contain engineering calculations that will confuse students. Instead, it applies math skills to the formulas needed by the technician-level student.· Full-color illustrations throughout the text.· Each chapter includes detailed Internet resources related to the chapter topics to allow further exploration.· Laboratory manual contains activities correlated to the chapter topic, and chapter quizzes to measure student knowledge.Bundled with the textbook is the student version of FluidSIM® Hydraulics simulation software. This popular software from Festo Didactic allows circuits to be designed and simulated on the computer. The software can be used to provide additional activities of your own design.